Highlighting the benefits of working for the Gillman family, this video celebrates 75 years of operation and growth. Produced by Moffett Productions, Jeff and Chris Wohrer and even Joe Krath make background appearances. This web video was shot in 4K on a Red Epic. 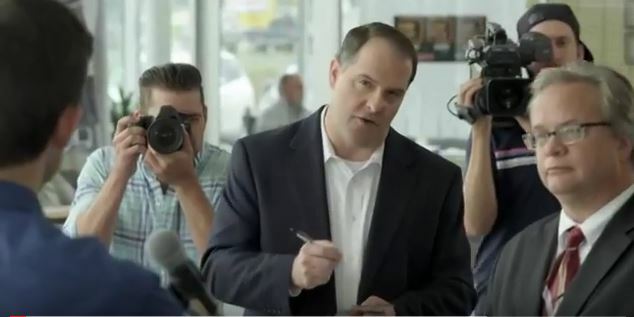 Audio for the shoot was recorded in and open dealership with actual employees of Gillman Automotive Group. Recorded double system, the primary mics were a hypercardioid condenser and Sonotrim lavs paired with Lectrosonics Digital Hybrid Wireless. A Sound Devices 633 was the audio recorder. This entry was posted in Advertising, Auto, Location Sound, Web Audio and tagged 4K, 75th Anniversary, condenser, dealership, double system, Employee, Gillman Automotive, Gillman Guy, Human Resources, hypercardioid, Lectrosonics dygital hybrid wireless, location audio, location sound, Moffett Productions, production mixer, recordist, Red Epuc, Sound Devices 633, Testimonials. Bookmark the permalink.